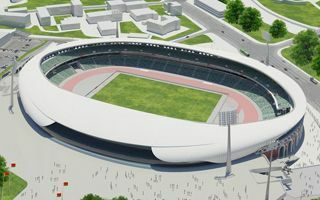 Belarussian minister for sports and tourism Alexandr Shamko announced during his interview with BelTA press agency that the reconstruction of Stadion Dinama in Minsk is ahead of schedule. The progress shouldn’t be challenged as funding is secured for planned works. The updated schedule is much more optimistic than expected before. Reconstructed stadium should be ready in 2017 instead of 2019. This will leave more than enough time to test the venue before it hosts the 2019 European Youth Olympic Festival. Stadion Dinama is being redeveloped within the external arcades of its predecessor. Once finished, it will hold 25,000 people with a running track. A completely new national stadium for football will be built in a different part of the city, next to the existing Traktor Stadion. Negotiations with Chinese contractor are said to be advanced over that project. However its final shape will differ entirely from what was presented back in 2013.